Album This song officially appears on the McCartney II Official album. Other singles from "McCartney II"
“Coming Up” is a song written and performed by Paul McCartney. It is the opening track on his second solo album McCartney II, which was released in 1980. Like the rest of the album, the song has a minimalist synthesised feel to it. It featured vocals sped up by using a vari-speed tape machine. McCartney played all the instruments and shared vocal harmonies with wife Linda McCartney. The single was a major chart hit in Britain, peaking at number 2 on the singles chart. In the United States and Canada, the live version of the song performed by Paul McCartney and Wings (released as the B-side to the single) saw much greater success. I originally cut it on my farm in Scotland. I went into the studio each day and just started with a drum track. Then I built it up bit by bit without any idea of how the song was going to turn out. After laying down the drum track, I added guitars and bass, building up the backing track. I did a little version with just me as the nutty professor, doing everything and getting into my own world like a laboratory. The absent-minded professor is what I go like when I’m doing those; you get so into yourself it’s weird, crazy. But I liked it. Former band-mate John Lennon liked the song and credited it for driving him out of retirement to resume recording. A live version of the song was recorded in Glasgow, Scotland, on 17 December 1979 by Wings during their tour of the UK. This version had a much fuller sound and was included as one of the two songs on the B-side of the single; the other B-side was also a Wings song, “Lunchbox/Odd Sox“, that dated back to the Venus and Mars sessions. Both B-sides were credited to Paul McCartney & Wings. Columbia Records wanted to put the live version on McCartney II but McCartney resisted the change, wanting to keep it a solo album. Instead, a one-sided 7″ white-label promotional copy of the Wings version was included with the album in North America. “Coming Up (Live at Glasgow)” has since appeared on the US versions of the McCartney compilations All the Best! (1987) and Wingspan: Hits and History (2001), while the solo studio version is included on UK and international releases. A different live Wings recording of “Coming Up” appears on the album Concerts for the People of Kampuchea, with an additional verse that was edited out of the Glasgow version. In the UK, the single was an immediate hit, reaching number two in its third week on the chart. In the US, Columbia Records promoted the live version, which subsequently received more airplay than the studio version. McCartney was unaware of Columbia’s move, otherwise he might have pushed for the A-side, which he thought was the stronger version. An executive from Columbia Records explained the switch by stating “Americans like the sound of Paul McCartney’s real voice.” This single became Wings’ sixth and final number one single. In the US, “Coming Up” reached number one on the Billboard Hot 100 and was certified Gold by the Recording Industry Association of America for sales of over one million copies. Although the live version received more airplay and was considered to be the “hit”, Billboard listed the A-side on the Hot 100 for the first 12 weeks on the chart, including three weeks at number one, before switching to the more popular B-side for the remaining nine weeks on the chart. “Coming Up” is also well known for its music video, with Paul McCartney playing ten roles and Linda McCartney playing two. The “band” identified as “The Plastic Macs” on the drum kit (a homage to Lennon’s conceptual Plastic Ono Band), features Paul and Linda’s imitations of various rock musician stereotypes, as well as a few identifiable musicians. In his audio commentary on the 2007 video collection The McCartney Years, McCartney identified characters that were impersonations of specific artists: Hank Marvin (guitarist from the Shadows), Ron Mael of Sparks (keyboards), and a ‘Beatlemania-era’ version of himself. 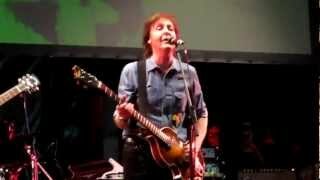 While others such as author Fred Bronson have suggested that there are other identifiable impersonations in the video, such as Andy MacKay, Frank Zappa, Mick Fleetwood and Neil Young, McCartney said the other roles were simply comic relief. “Coming Up” has been played in 274 concerts and 60 soundchecks.